An achievement to be proud of! Congratulations! In the depth of winter, I finally realized within me lay an invincible summer. HEY THERE NIGHTREAVER!!! it's BENNY!!!! I guess I too, will be taking a break. Mike, I know life for you has been busy so whenever you're ready to continue our story.. send me a message. For now, Valucre, I'm out. Just checking up on you, how are you doing? I am doing well love! How are you? I've been super busy and tired, the kiddos run me ragged. About the same, been pretty busy myself. Wrapping up this semester, have one semester left(the Spring) until I graduate with my Master's. I am totally ready to be done! Glad to hear you are doing well. Inside the barrier they moved forward and the darkness slowly began to sink in the further they got into the tunnels. It was chilly and damp, with a thick musty moisture lingering in the air. The decay inside the walls was sweltering and it was accompanied by the smell of blood and death. Rotting flesh, bones and nails appeared as the favorable décor that was painted on the walls and Alukai’s eyes flickered with a brilliant emerald green that seemed to illuminate in the shadows. Yet as they continued to wander and close in on the scent of Malaysia, something caused Alukai to stop in his tracks. There was another scent stirring in the air, something so faint yet so familiar. A woman’s voice gently resounded and echoed down the hall. “Alukaaaiii,” it said. Alukai felt as if he had been kicked in the gut as he saw a silhouette of a female forming from a distance. She was tall, dark haired and fair skinned, and her eyes were a piercing blue that seemed to cut through the gloom like a knife through butter. She was dressed in skin tight leather, steel braces resting on her forearms and chains wrapped around her legs from her thighs to her knee high boots. Her midriff was bare and on her left side rested a wicked looking sword with all sorts of pointed edges; A Venom’s Kiss. It was his worst nightmare, coming back to haunt him. His mother was dead yet she was in all of her beautiful glory. Had she gone to Underworld once Malice had taken away her soul? Did they reincarnate her just for this moment? The Chaotic Prince’s eyes narrowed as she started to walk towards them. “Mother? It cannot be you..” he spoke out loud. “You’re dead. You left us..” You left us. Those words rang in his ears, didn’t he say this to someone recently? The silver haired woman in the throne room before they left to came here. He was so certain she was his mother, he could smell her from a mile away. He couldn't have been mistaken, could he? In this thought process the barrier that he had provided started to flicker as his concentration began to wane. “You’re can't be real. You're not really here,” He said again. Kalicity continued to walk towards them, "Please my son, please forgive me for all of my faults. I never wanted to leave you behind.." There was not telling if Ayden could see this too. The enchantment was designed to interfere and play on the fears of those who chose to step within its reach. So what Alukai may be seeing, may be something completely different from Ayden. MorceLa’Kai only caught of a glimpse of the NightReaver that spoke, but from what he saw the Dark Prince liked the look of him. Intense sapphire globes rolled in their sockets as he shifted his gaze to Ana as she gathered her wits and climbed onto the back of Cody. The Dragon seemed rather content knowing the Princess was on his back, that was until with a few powerful leaps MorceLa’Kai stood on his back behind her. With a hand resting firmly on the hilt of A Venom’s Kiss, he buried his weight into his heels, bent his knees and pointed east. “Cody, make haste to the east.” With a parting maw and a high pitched roar, the dragon pushed himself into the air with powerful legs. Thick talons mercilessly tore into the ground while large, leathery and sinewy wings beat into the air but not without inflicting more damage to the castle walls as the wings caught inner portions of the courtward. It was unfortunate, but MorceLa’Kai was confident that the housekeeping staff and others alike were rather used to the castle constantly being destroyed in one way or another. No doubt they would be cursing under their breath later today. Once Cody was at a fair elevation, MorceLa’Kai would drop to his knees, straddling the spine of Cody and placing his right hand on the small shoulder of his niece. “Are doing alright, Anastasia?” He asked. But before she could answer, he twisted his body around to look at where the NightReavers were thus making sure they were hot on their tail. “Create a perimeter! 2 in Front, 2 on the sides, and 2 in back! We must protect the Princess at all costs.” He hoped he spoke loud enough for them to hear him, if not, he may have to use telepathy. However it appeared that would not be necessary, the NightReaver’s quickly adjusted and two urged their dragons to move in front of Cody. Despite Cody’s massive size, the smaller dragons were able to keep up with minimal effort. Two more dragons moved to the side but set on the backside of Cody’s wings, and the last two lingered on the back but on each side of Cody’s tail. Getting one last good look at their formation, if Anastasia wanted to answer his question, now was the time to do it. As Ayden set back, snarled and hissed, Alukai peeked over his shoulder back at his brother. The Chaotic Prince had never seen Ayden so rattled..over anything for that matter, so it was a new concept for him. Unlike Ayden however, Alukai was very accustomed to magic. It was all he really knew, and the idea of playing with swords and weapons was a rather foreign idea, but he adapted anyway. Together he and Ayden were two peas in a pod, complimenting one another against their strengths and weaknesses. As Ayden formed a suit of armor, Alukai looked on in awe. It was rather unique and beautiful and perhaps he had a touch of envy. He had never needed armor or required it, but what would he look like in it? Perhaps one day he would play with the idea and figure that out, but that day was not this day. “Ayden, I wish we had more time because then I would no doubt be able to break down the enchantment myself. I suggest you stay behind me and let me lead, I can form a barrier around us that can protect us. If it takes long enough, I may be able to build enough strength to shatter it completely. Another concern that is lingering in my mind is it may be designed as a test or a puzzle. We may have to perform a series of tasks in correlation to the illusions to break the spell. It may bring out your worse fears and bring them to light, but if that is so then we must choose the right path. Unfortunately we will not know until we get inside.” Alukai spoke as if he had seen this before, and he wasn’t sure where he was getting all of this information it was simply being fed to him through his kinetic energy. Taking one last glance at Ayden, the Chaotic Prince moved forward into the entrance. A soft silver glow immediately formed around him that creating a fairly large bubble. Ayden too would be inside this force field as well if he decided to stay close. The bubble illuminated in the darkness thus lighting their way. Something had changed in Ayden as the continued their trek south. Ayden senses were intensely heightened and he seemed a bit more focused than usual. Listening to the Dragon King, venomous hues narrowed on him. At first Alukai was slow to catch on, trying to piece together what his brother was saying. But then after a few seconds ticked by, it all made sense. Alukai then placed a firm hand on Ayden’s shoulder, “We will take care of him, but right now we need to finish this and rescue Malaysia.” Pulling his hand away he looked towards the glowering castle. Taking in all of the detail he felt a distinct power lingering inside of it, and it was an odd sensation and something he had never felt before. Approaching the entrance to the building, the Chaotic Prince extended his right hand and slipped it past the open threshold before slowly pulling it back out. Once again the chaotic energy inside of him began to stir, crackling and igniting within his vessel. “There is something different at work here, I feel there is some type of enchantment protecting this building. Once we go in, we may be faced with illusions and delirium. Unless there is a chance we could blow it sky high and shatter it to pieces..” Alukai then pushed forward in his mind, reaching out with his ethereal form and mind quickly searching inside. "Malaysia is in there, Ayden. She is waiting for us." "Forgive me Prince Nedane, for my old knees are not what they use to be. But a miracle indeed is what you'll need." Aremis looked up as Raxiz motioned them both to stand, and so he did. Strong, leather wings briefly stretched out behind him as if they had been put away for quite some time. "Tell me, does the dragon within control you? Or do you control it? What can you tell me of him?" Aremis slightly nodded, “I don’t know much about the dragon within me, my Lord. Save for the fact that he a dragon of fire, like my father, and he is powerful. Personally I would say that we control each other, but when the dragon comes out it is very difficult to really get a hold on him. The few times he has taken over he has been reckless and destructive. Right before I was exiled my father was trying to teach me how to control the dragon within me, but I have yet to master the skill.” The Prince became quiet and still as Raxis rounded the flames. He wondered what the ancient would do next with this information. 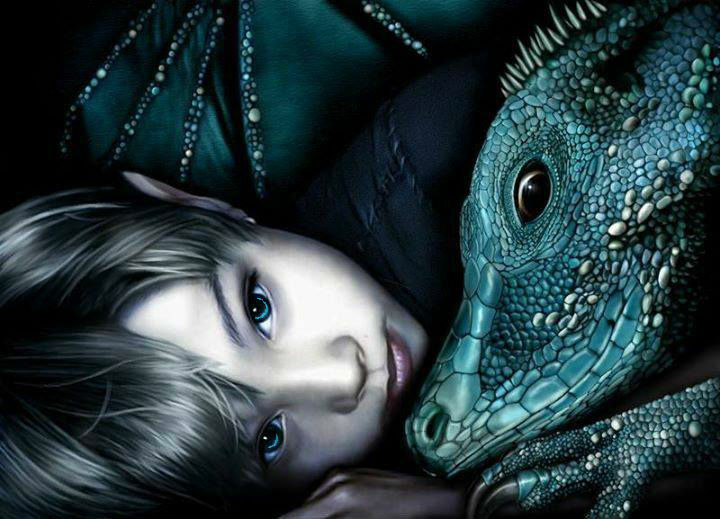 Would Raxis teach him how to control his dragon, or send him away until he was ready? The entire concept filled Aremis with worry and concern. Hello! The people who welcome newcomers are too pure for this world. "You can't take all the blame. Where were the guards? Where were your parents?" “I talked Ana into going out into the city with me, we were unattended and were not supposed to be there. My parents were unaware of our whereabouts. The golden shield's showed but it was too late. If I just would have listened to my mother, she never would have been kidnapped by the Underworld.” The memory lingered for a moment before set aside as they followed the hooded figure into the tower. Then, suddenly they were at the top. Aremis could see the view that overlooked the entire valley, it really put into perspective how truly big Vdara and its surrounding territories had become. "A Nedane and Valentine." Eyes drew to the man before intently listening to what he had to say. This was Lord Raxiz? Despite the formalities presented, Aremis would do the dragon one better. Gracefully dropping to one knee, his left forearm supported his weight and, his head dropped respectfully. Despite being a Prince, he knew that in the presence of an ancient being such as Lord Raxiz, it truly meant very little. “My Lord Raxiz, it is a pleasure to finally make your acquaintance. I am sure you are already aware, but my father sent me here on a quest. He told me that you would present to me a challenge, and that when I return to Vdara I must be able to beat him in combat. I fear it will take a miracle to accomplish such a feat.” Sapphire hues slowly peeked at Raxiz from beneath furrowed brows, hoping for some type of an answer. Only at Lord Raxiz’s request would the Prince rise from his position.